I’ve had this recipe a long time. I don’t remember where I got it. It’s probably from one of my old cookbooks, though I don’t remember which one. I made it once years ago and then never made it again. For the life of me, I don’t know why. They were a hit when I made them all those years go. 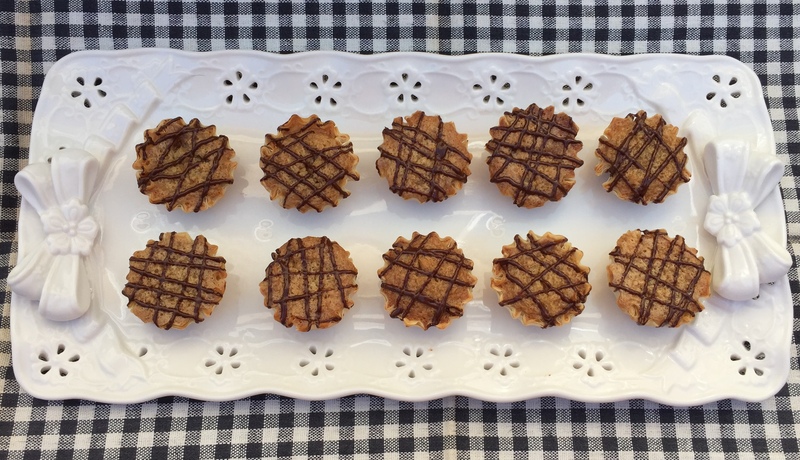 These tartlets are not only yummy, but they’re super-duper easy to make. The recipe makes a lot, too, which is perfect for a party or get-together. Place phyllo dough shells on a cookie sheet. In a small saucepan, melt butter over medium heat; then reduce heat to medium-low. Continue to cook, without stirring, for 5 to 6 minutes or until butter becomes brown and fragrant. In a medium bowl, combine eggs, sugar, flour, vanilla and salt. Whisk vigorously to combine. Whisk browned butter into egg mixture. Spoon filling into tartlet shells. Bake for 12 to 15 minutes or until tops are light brown. Transfer carefully to wire rack and allow to cool completely. Melt chocolate in microwave in 30-second increments, stirring until smooth. Drizzle melted chocolate on top of cooled tartlets in any design you want. You should get at least 40 tartlets (if not more) from this recipe, depending on how full you fill the shells. If you can’t get toffee pieces, you can substitute chocolate-covered toffee candybars, like Skor, Heath or Daim, and chop them up. To store, layer tartets between sheets of waxed paper in an airtight container. Cover and store in refrigerator for up to 3 days or freeze for up to 3 months. If frozen, thaw tartlets at room temperature for 1 hour before serving.